I know this is written a day late but I was simply wiped out last night. We had a great Easter fly at the park yesterday morning. John and I had intended on getting to the park early and putting up the club banner and some of the other banners that I have for a ground display in honor of Easter. Well, John wasn’t feeling well when he woke up and decided it was best that he stay home. Of course that meant there was one less person to carry a kite bag. So plans were revised. I left the dragon kite bag at home and took an anchor and line bag and two long bags of kites and banners. Not too much to carry up the road. There were already some fliers there when I arrived. And I wasn’t late for a change. 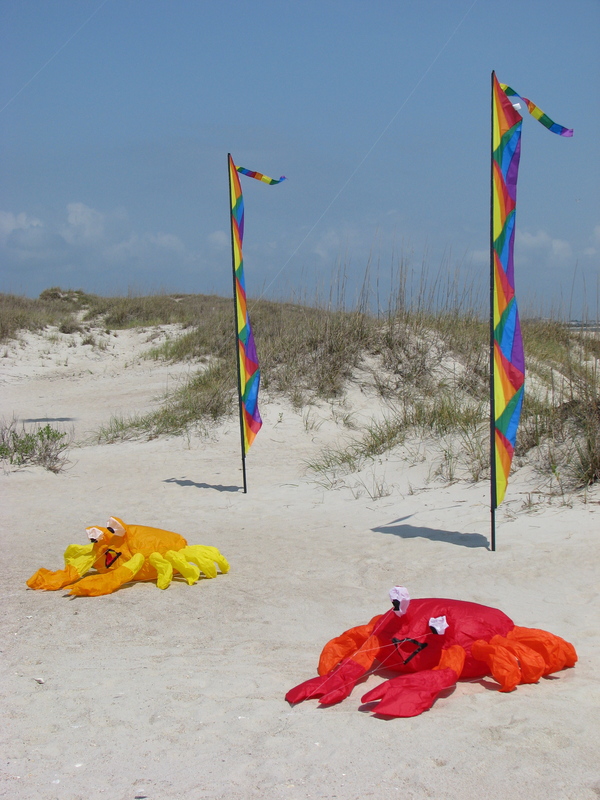 I put up my two new quilt banners ( or as my friend Don calls them “those damn banners” ) and one yellow crab and one of my new red crabs. Just a small ground display. 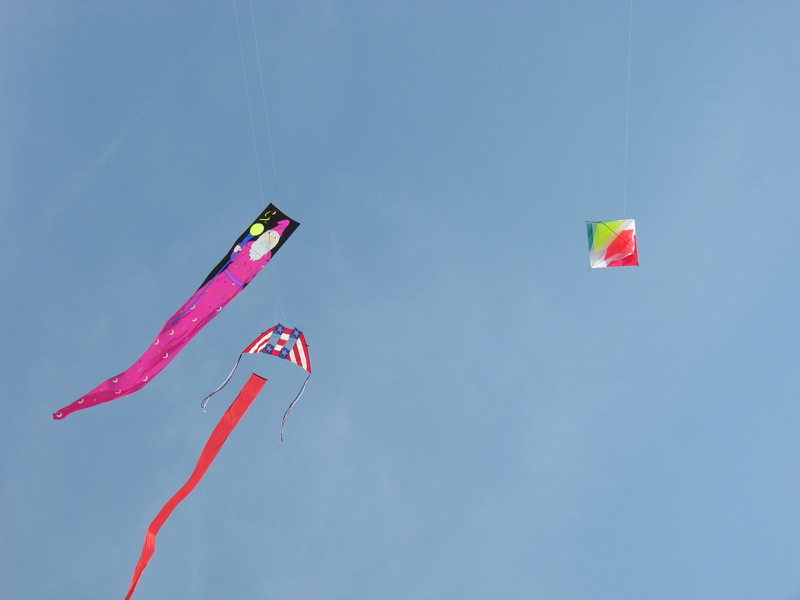 Several families came out to enjoy the beautiful day and fly kites. There were quite a few visitors from out-of-town flying their stunt kites and deltas. 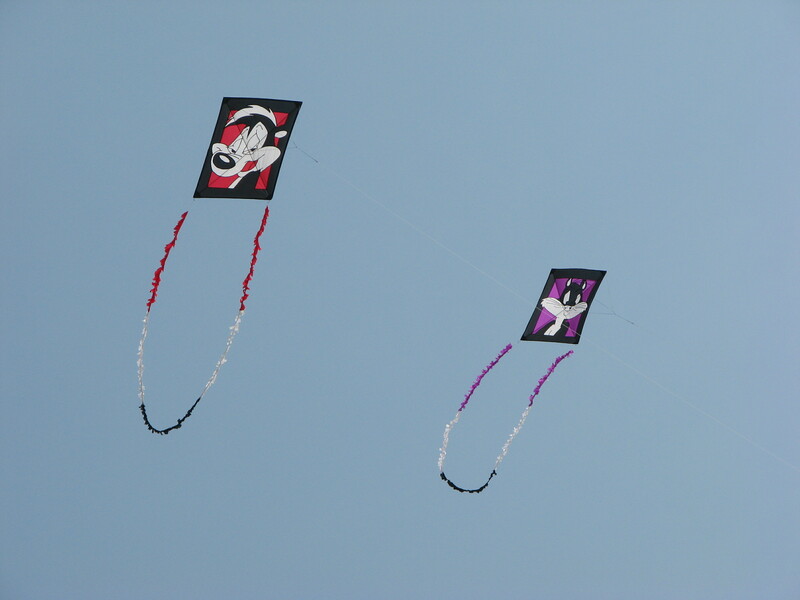 Some larger kites were put up by a couple of the regular fliers. You could say we put our colored Easter eggs in the air instead of in a basket. One gentleman put up a larger Sutton and hung a KAP rig from it. KAP stand for kite aerial photography. A remote control triggers servos mounted on a hanging platform which moves a camera in all directions to aim it and controls the shutter. With a digital camera you are limited only by the battery and the size of the memory card as to the number of photos you can take. I’ve been a little interested in doing this, so this gave me a chance to see a KAP rig. I’m not going to jump into it just yet. But it was nice to talk to someone who does it regularly and see how it works close up. Maybe someday. The day only kept getting better and better. Winds picked up a little and the sky was a brilliant blue with only a few clouds. I hadn’t had a chance to fly my cartoon pair at home yet, so this seemed the perfect time. Up went Pepe Le Pew and Penelope Cat. They flew side-by-side while I was able to get some photos of them together. At times it really seemed like Pepe was chasing Penelope. So after putting up the ground display, visiting with friends and other fliers, and anchoring my two kites in the sky, it was time to have some fun. I borrowed the quad-line kite known as the Vamp Devil by Flying Wings and set about to practice. I love flying this kite. 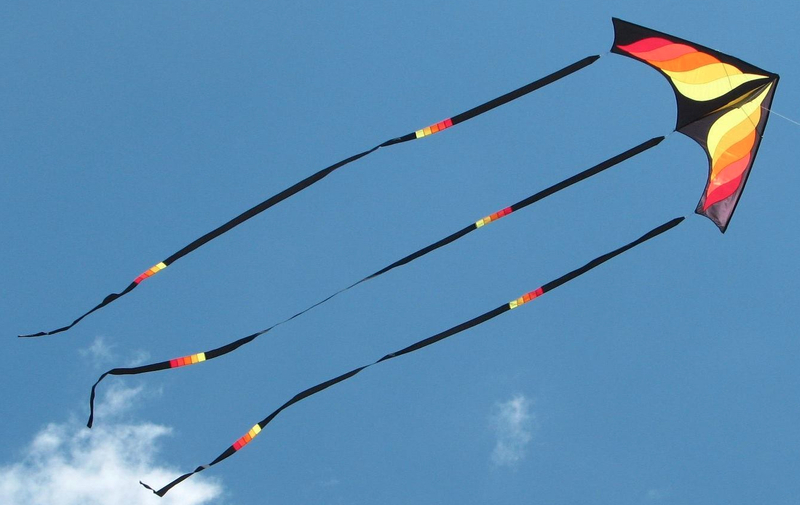 And that is quite remarkable since it wasn’t too long ago I made the statement I wasn’t going to fly a quad-line kite. But this one has won me over. It flies slower than most quads and not quite as precisely. Maybe that’s why I like it so much. I’ve figured out how to put the four lines on a winder so I’m not spending a half an hour untangling lines before flying. That in itself is quite a feat. Though most ling-time quad fliers would disagree with me. One young lad on the beach with his family must have enjoyed the show the kite put on, as he kept telling his mom to “watch out for the bat”. And that is exactly what the Vamp Devil looks like. It was past noon and time to go home and check on John. We were supposed to go out for Easter dinner with friends and so I was hoping he would be up to it after staying home in the morning. I stopped off at the kite shop to return the Vamp Devil and visited for a while. Then home to get cleaned up. Hope everyone had a good and restful Easter. I know I did.